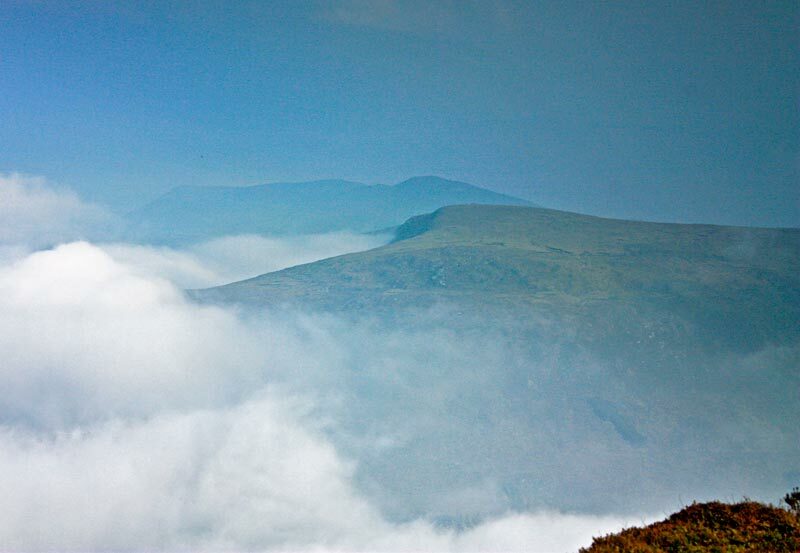 Three cairns on the summit ridge of Dromavally Mountain are named Cú Chulainn's House, Cú Chulainn's Bed and Cú Chulainn's Grave. 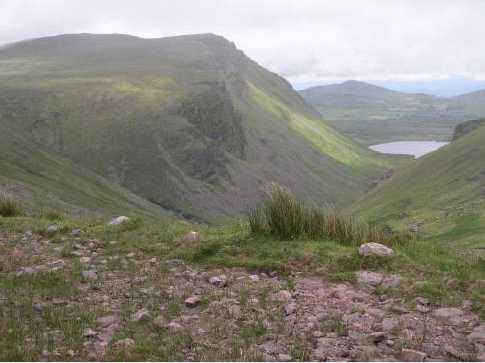 It is intriguing that there are several folk-tales about Cú Chulainn recorded on the Dingle Peninsula, far away from his home area in Cooley and SE Ulster. See Knockmulanane for the legend concerning Scál Ní Mhurnáin, Cú Chulainn and the giant. Previously Reamore in MV. Dromavally Mountain is the 415th highest place in Ireland. Coming out from Tralee I took the road to Camp. The Milesians who came originally from Egypt, settled in Spain, and invaded Ireland in 1700 BC fought their first battle in the mountains near Camp. The Tuatha Dé Danainn – the ruling tribe of Ireland at that time – opposed them. Their Queen Scota and another Milesian princess Fais were among the slain. Scota is buried on the mountainside in view of Tralee Bay at a place called Glenscoheen (Scota's Glenn). The Milesians won the battle and the war for the conquest of Ireland. The Kings and Queens of the Tuatha Dé Danainn were killed and legend has it their people were driven underground into forts and mounds where they became the fairies. 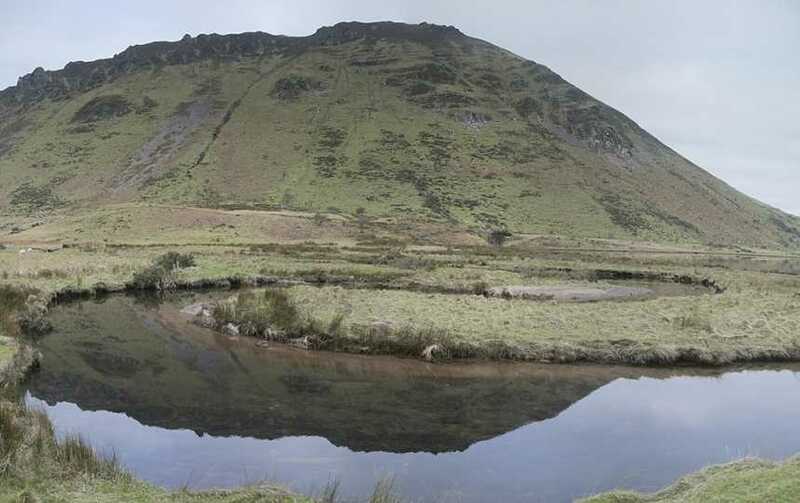 From Camp I carried on to Anascaul ,the giant Cu Chulainn is said to have lived in this area. The ruins of his house and castle are said to be the cairn Q590 062 B in the mountains above Anascaul lake on the way to Reamore. It was from Anascaul lake that I began my walk. From Anascaul I took the first road to the left after The South Pole Inn and followed the signs for the lake.This road leads to the lake shore where there is room to park six or so cars Q583 052 C. I followed the track along the side of Garrivagh river which passes over three small bridges before gaining the plateau at approx 370 meters. From the track end I headed for Beenoskee passing some rocky,Old Red Sandstone outcrops on generally good ground with some easily avoided patchs of bog. As I neared the summit mats of Crowberry with pink flowers just beginning to appear were abundant. On the rock strewn summit of Beenoskee I sat in the mist behind a small cairn for my lunch, the only views to speak of were of Loch an Choimin some 200 meters below and the rainclouds approching from the west over the Connor pass. Thankfully the threatening rain did not fall and by the time I reached Stradbally Mountain and turned around to head for Coumbaun the murky morning had given way to glorious afternoon. From Coumbanes grassy summit I carried on to another at Beenatoor.These are small hills when approached from this plateau but what excellent views over Brandon Bay. 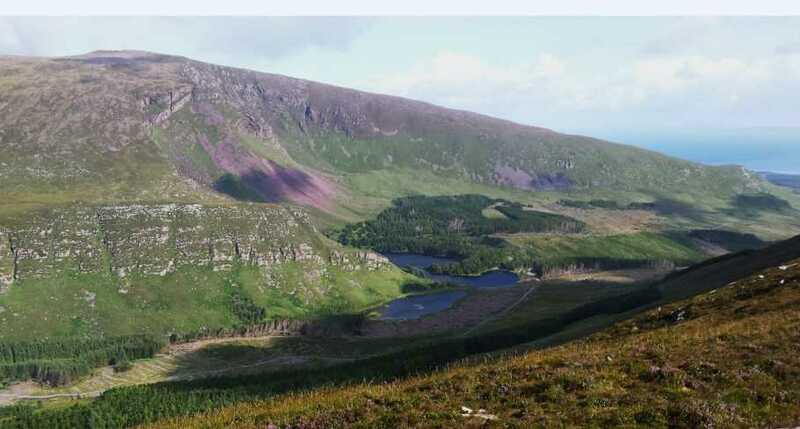 I skirted around the source of the Mhacha na Bo river and back towards the track to Loch Anascaul in brilliant sunshine. See Track 2630: The ascent from the Coillte inner car park at Q 5998 0784 D, which is circa 210m in height, to the summit at 552m, is difficult enough, initially along a fence between newly planted and felled forest, and then on steep grassy slopes, gradually softening as height is gained. (The OS Map suggests trees to the summit: not true, only on a minor belt of the lower slopes) Gaining the summit is really the main work of the day over: the rest is pure hillwalking heroin. From here I walked southwest along the broad spine taking in the unobstructed views of Iveragh across Dingle Bay to my left (see attached photo) and the prettiness of the steep sided valley on my right. A real thrill came as I contoured towards the head of the valley, descending gradually along the edge of the cliffs and seeing constantly changing views of the pocket. A river tumbles over the head ( Q 5880 0714 E ) through soft ground and offers an escape route to the forest road below if required. I continued around the cliff horseshoe, until I was on the very steep ground over the Loch Cam, and contoured until I found a gully safe enough to descend at Q 59362 07887 F. Circling the lake was a simple matter as Coillte have erected a boardwalk the whole way around. Picture from simon3 : Dromavally from the north, with Brickany backdrop. Picture: Dromavally from the north, with Brickany backdrop. Misty view from the North. Here is a misty view of the summit from the NW on the ridge that extends East of Stradbally Mountain. The murky skyline of this picture has the small summit of Brickany in it. The picture makes Brickany look higher than Dromavally however the true relationships in the picture are something like this.